So having crossed the border with Macedonia we kept climbing through a picturesque valley to the top of the pass before dropping down. There was a howling headwind at the border crossing but as we entered the country the sun came out and spilled out over the mountains. It stayed with us for our whole time in Kosovo! We received a passport stamp at the border which we were both excited about as we thought 2017 would be a stamp free year – another one to add to the growing collection! 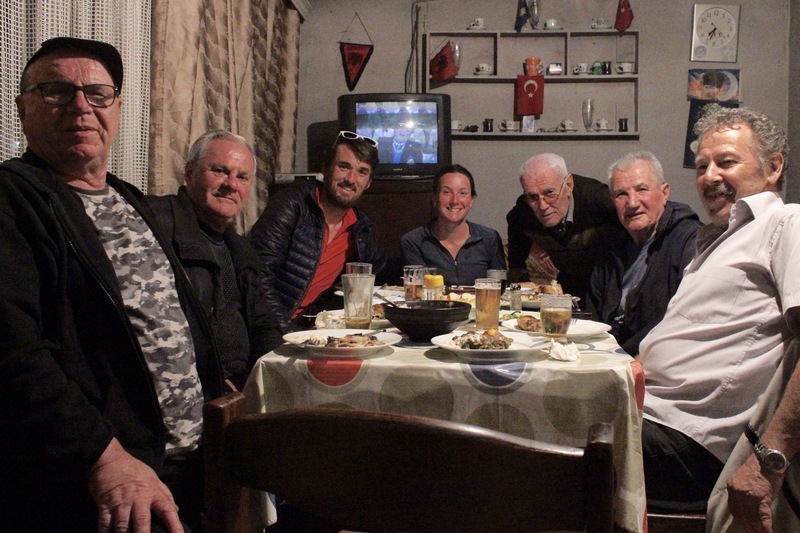 We dropped down into a place called Doganaj and treated ourselves to a meal in the local restaurant before cycling a few kilometres to a wooded area off the road where we pitched the tent. Just as we were drifting off to sleep we hear some shouting from the road. Paddy goes out to investigate and finds three 20 something year olds teetering on the edge of the wood. They were super friendly and asked if we wanted to come back to their house instead of camping but we declined explaining we were all set up and already in bed. The next morning we had a 1000m+ pass to cross. The inclines and roads are great here and we made good progress. The countryside is lovely around here and we pass through a number of towns including the Ski resort town of Brezovice – apparently the resort is a decent size with a good selection of runs. There’s no snow in the town now but the high mountains are still very much covered and the views were spectacular. We manage to reach the top before lunch. It was a Sunday and there were lots of families picnicking here at the top. 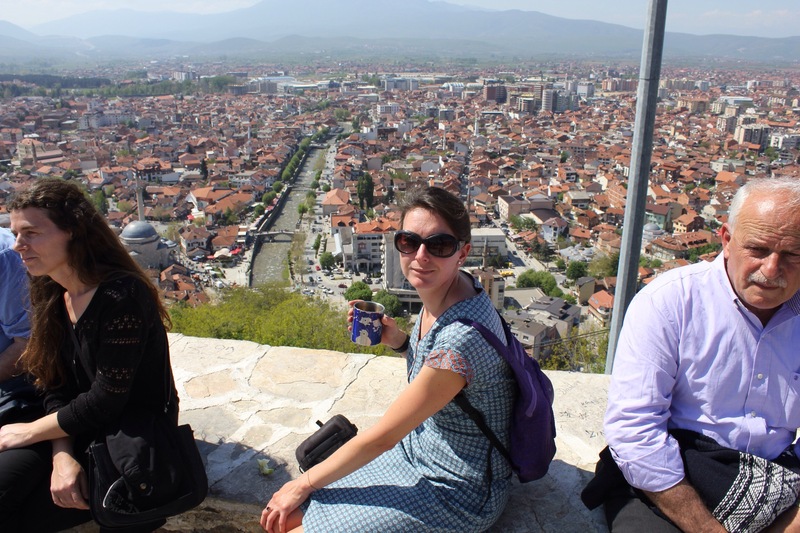 We then had a long down to the lovely town of Prizren which is full of old buildings and bridges and lots of restaurants which line the riverfront. The town is absolutely heaving and we stop to enjoy the atmosphere with an ice cream in one of the riverside squares. After enquiring at all three Hostels and being quoted overblown prices we decide to cycle back up the road and scout out a camp spot instead. A few kilometres from Prizren upriver there is a collection of allotments and homemade summerhouses. As we’re stopped on the road looking down at this potential camping spot a group of men call out to us. I run down to investigate and am greeted by Bardi who asks me if I speak French. Time to test that 13 year old GCSE I got!! It turns out that the ‘garden’ was actually what Paddy and I came to call the homemade ‘man den’. It was brilliant! A lovely spot right by the river with a small garden, vine covered balcony, big barbecue, electric stove, running water and one inside room with sofas, tv and a big dining table. Bardi and his mates who are all in their 60s and 70s come here almost everyday to eat and hangout together. Many of them are still married but I didn’t like to get too much into what they get up to in the meantime… I like to think they’re having as much fun as Bardi and his mates have in the man den. Bardi spoke very good French which he learnt in school and perfected during a short stay in France in his youth. Before he retired he worked as the head receptionist and later the bookkeeper for the biggest hotel in Prizren. Naturally he was the accountant for the group and kept a little black book which detailed everything each of the guys owed for the food and upkeep of the man den. They were great company and we ended up making this spot our home for the next two days, sleeping on the sofa bed at night and eating delicious home cooked food prepared by ‘Doktor Cusine’. ‘The Doktor’ as he was commonly know by the group was a lovely guy of Turkish decent in his 70s. He was the one who looked after everyone, preparing the food and constantly making us Turkish coffees. We concluded that the den was owned by The Doktor because there was always Turkish music programmes playing on the TV and Turkish flags hung up on the walls. 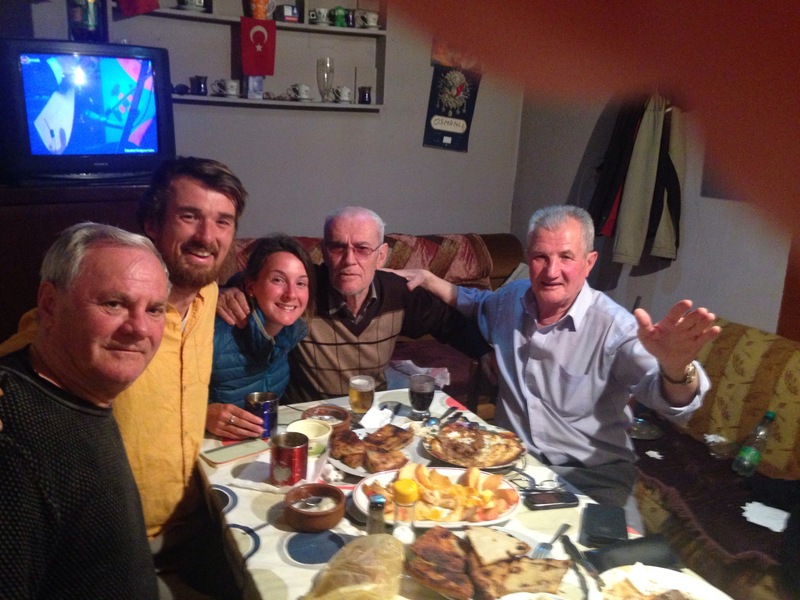 They were all so hospitable and welcoming to us and we enjoyed eating with them in the evenings. One very interesting difference between us and the gang was the speed in which we eat. 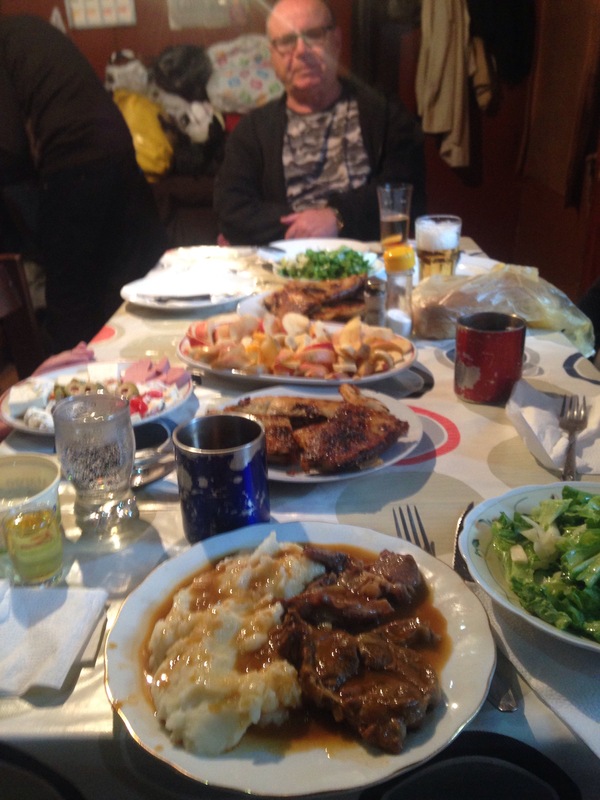 Kosovans – it turns out – take a long time to eat a meal. Now, since being on the trip Paddy and I have probably developed a bad habit of engulfing our food as quickly as possible; but even taking this into account, the difference between our eating paces was incredible. In theory we can both get on board with this relaxed approach to dining, but in practice it’s goes completely against everything we know to let a plate of steaming, succulent beef stew and creamy mashed potato go cold. The lads took 90 minutes to finish this meal something we just couldn’t understand! 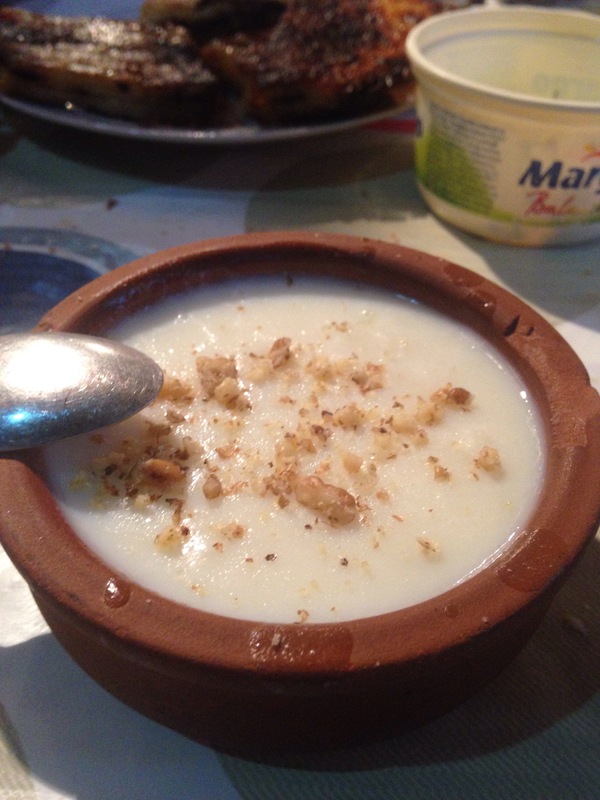 We did manage to take our time over the homemade rice pudding. 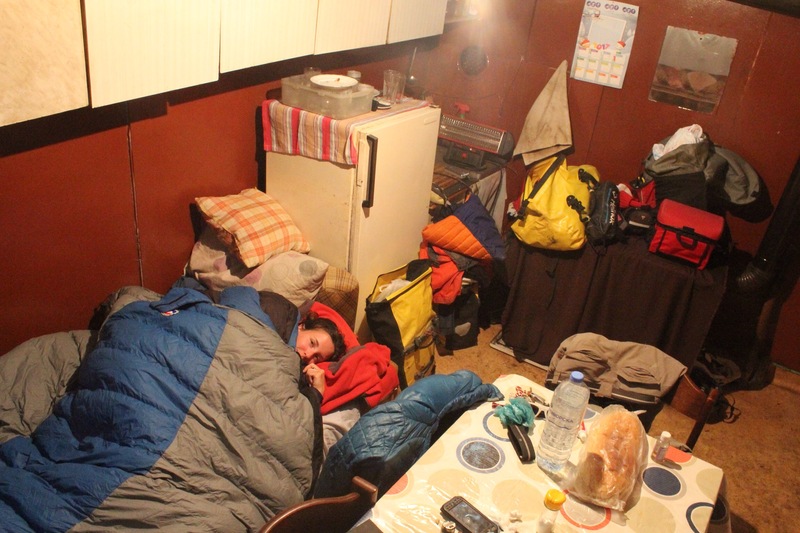 At the end of every evening each of them took a box of leftovers home with them and left us to snuggle down into our sleeping bag. In between these two enormous meals dished out by the Doktor, we had a lovely rest day washing the bike, ourselves and all our clothes before walking up to the castle fort which overlooks Prizren. We enjoyed clear blue skies and a picnic at the top before walking down to meet Bardi for coffee in the town. From here we’re crossing the country across the flat plain towards the Montenegrin border. 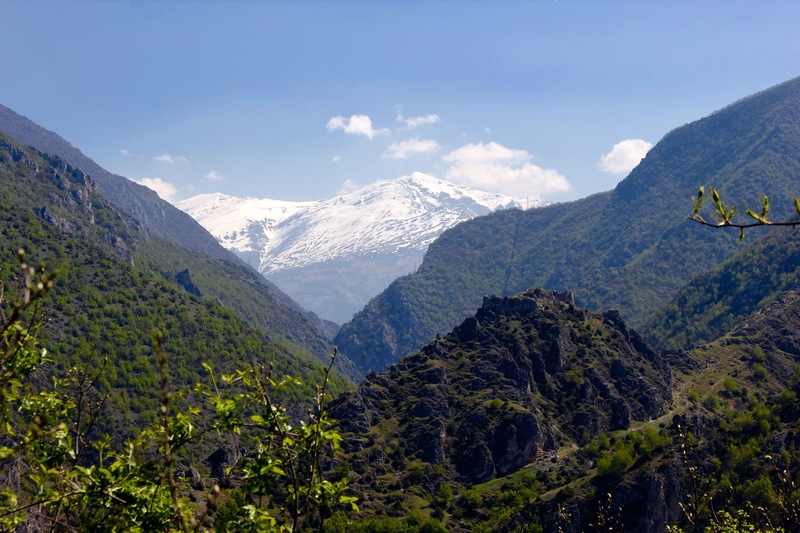 Previous Previous post: Kosovo – Country No.17!! !